Aha! Did I get your attention? 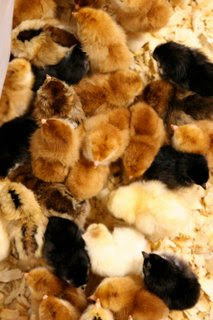 We are indeed expecting delivery of 24 newly hatched day old chicks on Nov 24th. That will give me several weeks to get my brooder ready for my little peeps. I can hardly wait! These are what they will look like when they arrive. We're also designing a chicken tractor for when they're ready to go out in the big world. They will be free range chickens. We've been fortunate to be able to buy fresh free range eggs locally but are looking forward to having our own chickens. I ordered four different varieties; one of them being Ameracaunas to lay colored eggs. Jacob thought it was pretty cool this past summer to cook with green eggs. I'll update with their arrival. Hi I was sent a link to your blog by Marci from "Down on the Farm". She thought I would be interested in your blog. Looks like we do have a common interest.....PECANS! I hope we can stay in touch....I will take some time to go thru your past posts. I did hate to see you pushing down some trees but you cant live in a tree house either, lol. The majority of our trees our Cape Fears and Summners. They are late to harvest....we usually dont get started shaking until the end of november....you know...when the price goes down! Anyway.....I'll be back! Tina, thanks for stopping by. I have visited your blog in the past and enjoyed it immensely. I would love to visit with you about your orchard. Unfortunately, the drought has left us with little harvest this year.